Expect a night to remember with top quality music from this excellent group. We are delighted to have The Fiddle Set as the main event on our programme this year. 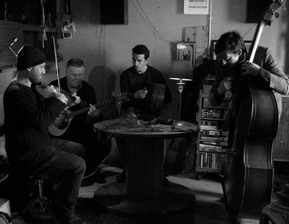 The Fiddle Case are Eoin O’Neill, Adam Shapiro and brothers Jon & Kieran O’Connell. 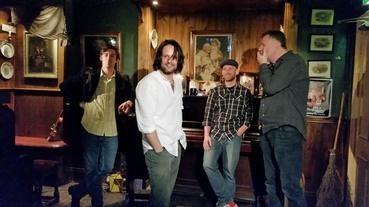 A North Clare based band bringing years of experience combined with a new freshness, which is loved by their audiences in County Clare and internationally. Eoin O’Neill has been playing his bouzouki in Doolin and around the world for over 30 years; and since double bass player & singer Jono arrived on the scene they have developed a unique and tasteful approach to backing trad music. They are joined by ace fiddler Adam Shapiro, who’s sweet tone with driving, tasty bouzouki and double bass accompaniment ensures a full sound, ranging from pure trad to spontaneous supercharged jams, with emotional and raw renditions of songs. 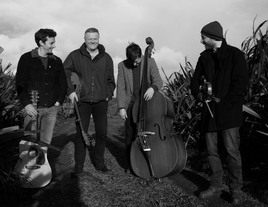 The Fiddle Case have recently been joined by Clare man Kieran O’Connell. Kieran plays the bodhrán and guitar, but is known more for his unique and powerful voice. The Fiddle Case have gigged and toured all over Ireland and Europe, including festival gigs as diverse as Na Fir Bolg in Belgium to Fleadh Cheoil na hÉireann in Ireland. Other notable gigs have been Doolin Folk Festival and supports to Christy Moore and Stockton’s Wing. A recent collaboration with Luka Bloom was well received, and the two came together for a sold out concert in Doolin in February, where along with some choices from either set list, they sought to re-discover and interpret a collection of well known Irish ballads.